A simple side dish, but with sophisticated flavours. 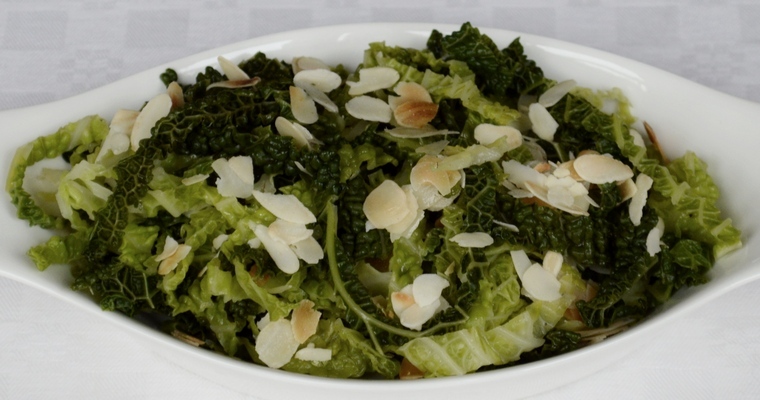 Shredded savoy cabbage leaves are gently steamed, and then tossed with honey and toasted almond flakes. In contrast to the sleek and rubbery white cabbage, with its hard leaves and squeaky crunch, the rough-coated savoy cabbage yields tender leaves and a milder taste. This makes it a great sop for sauces and cooking juices on the plate, as the crinkly folds are very absorbent. In fact, I frequently use finely shredded savoy cabbage as a spaghetti pasta substitute. This simple recipe brings out the natural sweetness of Savoy, and is particularly good with red meat or oily fish like mackarel. Lay the cabbage on its side on a chopping board, and chop off the thick stalk at the bottom. This will free the leaves from the core. Pull off and separate the leaves, discarding any tired or damaged outer leaves. When it becomes difficult to pull off any more inner leaves, remove more of the core to free the leaves. Once you have separated all the leaves, lay each leaf flat on the board and chop out the stalk that runs down the middle. Shred the leaves (stack four or so leaves at a time on top of each other, and roll into a tight cigar shape. Keeping hold of the cigar with one hand, slice finely with a large knife). Place the shredded cabbage in a steaming pan over a medium heat, and steam for 5-7 minutes, until tender but still crisp. Taste the cabbage to check that is cooked after 5 minutes, and then every minute until satisfied. Tip into a colander and leave to steam dry for 2 minutes. Meanwhile heat a dry frying pan over a medium heat. Add the almonds and lightly toast until golden brown – about 2-3 minutes. They will brown very quickly, so keep an eye on them and shake the pan frequently to avoid burning. One cooked, remove from the pan and set aside (otherwise they will continue to brown from the residual heat). Melt the honey in a saucepan over a low heat, then immediately turn off the heat. Add the salt, pepper, cider vinegar, almonds and cabbage and mix well using a wooden spoon. Taste and adjust the seasoning if necessary. Transfer to a serving dish and serve hot.